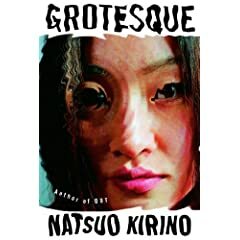 I love Japanese horror film and literature, and have heard wonderful things about Natsuo Kirino's fiction, so I expected great things from her novel, Grotesque. This psychosexual thriller is told by four narrators, and Kirino's talent is evident as these individual narratives add up to more than their sum. Kirino presents the diaries of two murdered Japanese prostitutes, as well as the confession of the immigrant Chinese murderer. The two prostitutes' lives are intertwined originally through one of their sisters, the other narrator who pulls the individual stories together. Interestingly, these characters (as well as several ancillary figures) are well-developed and draw the reader into the storyline. If you like your horror with a psychological bent, this book is for you. My next book is In Persuasion Nation, by George Saunders .